Annie was preparing food for a friend's brunch party (she always gets asked to do food for gatherings here and there -- birthdays, showers, meetings, etc). Since I did so well making crepes last time, she asked me to do them again. Recipe from "Chantilly Crepes" by Rose Levy Berenbaum. 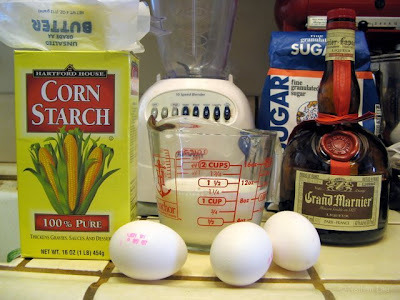 Blend ingredients at high speed for 10 seconds. 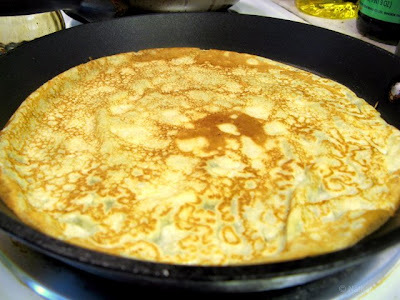 Brush a med-hot pan lightly with clarified butter and ladle 2 tbsp of the crepe batter into the center. Move batter in a counter-clockwise direction until the pan is covered. Cook until the edges begin to brown, then flip and cook another 10 seconds. Remove to a plate to cool. Make another one. Don't you think these crepes look like Chantilly lace? 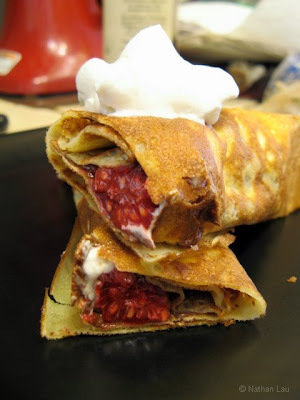 Here they are filled with Nutella, fresh raspberries, and topped with whipped cream. Also works great with blackberry jam. Eat, repeat. Wanna watch a video of me making these Chantilly Crepes? It's so easy!